NANA KWAME ADJEI-BRENYAH is the New York Times-bestselling author of Friday Black. Originally from Spring Valley, New York, he graduated from SUNY Albany and went on to receive his MFA from Syracuse University. His work has appeared or is forthcoming from numerous publications, including the New York Times Book Review, Esquire, Literary Hub, the Paris Review, Guernica, and Longreads. He was selected by Colson Whitehead as one of the National Book Foundation's “5 Under 35” honorees, is the winner of the PEN/Jean Stein Book Award, and a finalist for the National Book Critics Circle’s John Leonard Award for Best First Book and the Aspen Words Literary Prize. "I can't remember the last book that has moved, unsettled, inspired me the way Nana Kwame Adjei-Brenyah's Friday Black did. From challenging the reader's unconscious biases through a narrator who rates his "Blackness" on a 1-10 scale, to creating a semi-speculative thought experiment in which racism is treated as a cultural pastime, these are stories in which the satirical humor cuts as deep as its gritty violence." "Impressive...There's enormous talent on display in Friday Black." "In this vivid, original story collection, Adjei-­Brenyah presents ­America in all its racism, weirdness and abject consumerism." "Surreal, sobering, and tender all at once, this debut collection shines a laser-sharp light on the experience of being black in today's America." "Adjei-Brenyah’s surreal, dystopian Friday Black is 2018's avant-garde darling." —Entertainment Weekly, "The Oscars of the Book World"
"Picks up where Boots Riley’s film, Sorry to Bother You, left off, tackling racism in the U.S. jarringly and head-on...Tense, emotional." "Inventive and stirring...Ingenious... [His stories] are so daring and mind-bending that you haven’t a clue where he’s going to take you...Adjei-Brenyah is a versatile writer who creates a micro-universe with each story that explodes our expectations and takes us inside frustrated lives." "Surreal, startling...Composed with brio and rare imaginative power, Friday Black recaptures the strange fear and excitement we first feel as child readers, when we begin to learn that Grimms’ fairytales are approximations of the real world." "Yes, anyone who likes Saunders should read Friday Black right away. Anyone who could take or leave Saunders should, too...No comparison can convey a book's intellectual heft, and Friday Black is as intellectually hefty as fiction can get. In these twelve stories, Adjei-Brenyah turns over ideas about racism, about classism and capitalism, about the apocalypse, and, most of all, about the corrosive power of belief. His work is fiercely, spikily funny. And no matter how supernatural his stories get, no matter how zombie-ish or futuristic, every one of them takes place in the world we know...Adjei-Brenyah has some serious powers himself. The energy in his fiction is wild, barely controllable yet perfectly controlled. Short stories, as a form, tend to compress big emotion into small action, but not these. Adjei-Brenyah fits big emotion, big action, and big thought into each story. His violence is never gratuitous, his ghosts never too chain-rattling to believe...Adjei-Brenyah speaks in more voices than seems possible, and those voices will follow you off the page...They will assert themselves, over and over. I'm here, these stories say. Sit up. Pay attention. I'm here." "Straight up breathtaking. I always love to read a book and think 'I have no goddamn idea how this person is this good.' It's so good." "Striking and topical...This high-concept and morally rich collection is discomfiting and moving, savage in its social critique yet generous towards its characters. It ends with a lovely, tempered note of hope...The stories that Adjei-Brenyah tells are terrifying. But, in our reading them, at least we’re not alone." "One of the most exciting fictiondebuts of the year...By turns funny, tragic, and unsettling, Adjei-Brenyah’s stories work their way under your skin and stay there, leaping out at you when you least expect it." "Like taking a direct hit from a fellow shopper on Black Friday, this book will knock the wind out of you. Adjei-Brenyah's utterly fresh debut feels like a marriage between the chilling 'battle royale' scene in Ralph Ellison's Invisible Man and the boundary-leaping fiction of George Saunders...Piercing...Adjei-Brenyah writes with mind-blowing imagination and a heart on fire, like he has X-ray vision to penetrate the American soul." "Darkly humorous satire of the dystopic results of an American culture conditioned to accept the excesses of capitalism, racism, and structural violence as the norm. The extraordinary becomes quotidian. And somehow Adjei-Brenyah retains a semblance of hope." "Friday Black announces the bold and innovative voice of Nana Kwame Adjei-Brenyah. His 12 fierce stories animate — and, at times, amplify — a truly devastating portrait of race relations in our country today...Adjei-Brenyah’s debut collection very much falls within the literary continuum of The Underground Railroad, a sort of contemporary, satirical counterpart to [Colson] Whitehead’s novel about slavery...Adjei-Brenyah is clearly creating his own world here — and readers need to pay attention." "Black Mirror meets George Saunders meets Get Out; that’s how I would characterize Adjei-Brenyah’s bleak, tender, darkly satirical debut collection, which creates indelible absurdist dystopias in order to magnify what it means to be black in America...The best stories in Friday Black are brutal, breathtaking nightmares that will stay with you long after the final pages are turned." "By pursuing this human need to belong (and also resist), Adjei-Brenyah gives us stories that are covered in dystopian gloom but also imbued with an illuminating hope. Whether his characters are on the bus, at a fortune teller’s, or in a hospital room, Adjei-Brenyah’s stories convey the wide range of human experience and the endless limits of imagination." "Strange, dark...Its satire is the blackest of black, asking hard questions about race, about consumerism, about savagery in both the world imagined and the world around us...For all the misery and death in the book, it's a wicked-good read dashed with warmth, hope and humor. [Adjei-Brenyah] hasn't given up on homo sapiens. Far from it...Yes, there's suffering. Yes, people of color die at the hands of systemic racism. Yes, he takes all of those truths and inflates them in fiction, pushing them to head-cracking extremes, warping them into a vivid panoply of dark fables peopled with ordinary folk. But to paraphrase Monty Python, we're not dead yet." "An unflinching examination of the world we live in told through science fiction, humor and satire. By stretching the ordinary into extraordinary, Friday Black takes on race, consumerism, violence and complacency with remarkable skill and poise...Adjei-Brenyah's style allows readers to question themselves, their communities, and ultimately the world." "Cutting from start to finish, a deep stare into the sociocultural abyss shot through with bleak humor...Adjei-Brenyah prods at tropes and expectations to create affective and moving stories...Adjei-Brenyah creates sweeps of dystopic horror that don’t appear much different from the present moment at all. Nothing in Friday Black feels impossible or unreal; in fact, the punch of the constant violence is that it’s utterly plausible despite the purposeful edginess of literary surrealism. Issues of authority, power, and social violence are dealt with as sticky webs, hideous and interrelated, whose effects are all-encompassing and inescapable...The perspective Adjei-Brenyah is offering on black masculinities in America is vital and significant. He is also working with a set of literary tropes (and a style of edge-pushing short fiction in particular) that are reminiscent of Chuck Palahniuk...The collection is multifaceted, provocative, and focused first on affect. His willingness to explore ethical and emotional complexity, offering incisive portrayals and few simple answers, gives Friday Black the kind of heft I don’t see often in short fiction debuts...An important book for our contemporary political moment." "Exceptional...Adjei-Brenyah has unleashed a ferociously indignant howl against America's worst impulses...The astonishing intensity of Adjei-Brenyah's scenarios are so at odds with the measured, almost workmanlike prose used to convey them that the extreme suddenly seems uncomfortably less outlandish...Time and again, Adjei-Brenyah's audacious magnifying glass reveals startling truths...There is subtlety here, too, which adds to the emotional weight of these stories...But without a doubt, it is the perversion of the familiar that shocks the most, because while these stories are exaggerated, they are frighteningly recognizable." "These stories magnify what it means to be black in America—wherein your very presence can be deemed threatening, and therefore worthy of capital punishment—through a satirical, uncanny lens, reflecting back just how absurd and dehumanizing our reality is. They force us to reckon with our country’s toxic racism and consumerism while being compulsively readable and somehow even funny...America might be dehumanizing, Adjei-Brenyah seems to say, but we can still be human." 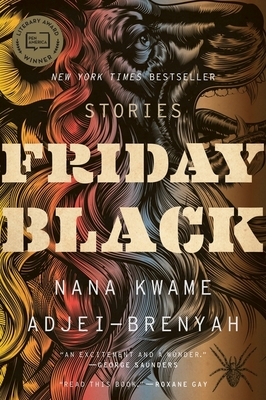 "In 2018 one intoxicating short story collection cried out for special attention among its lauded peers, and Nana Kwame Adjei-Brenyah’s Friday Black has haunted our dreams and plagued our nightmares ever since...[An] exhilarating blend of wildfire imagination, blood-freezing terror and ingenious wit...This is a book not easily forgotten. Its bold ideas and vivid metaphors creep into your brain at unexpected moments, like a unrelenting earworm suddenly singing on your head while you attempt to conduct a conversation, catch a train or follow a complicated movie plot. It’s hard to read a story about white misperceptions or racially-aggravated injustice, or even to look upon a young black man slouching under a baseball cap without an image from Friday Black pushing its way to the front of your brain, forcing you to process the everyday through an Adjei-Brenyah filter. Adjei-Brenyah, the son of Ghanese immigrants, has landed on the literary scene fully loaded, full of inventive and provocative ways to make his readers sit up and think again – think harder – about the lives of black Americans. Like the two landmarks in contemporary black American pop culture his book is most frequently compared to – Jordan Peele’s movie Get Out and Childish Gambino’s video for This is America – it weaponises hyperbole, fantasy, horror and surrealism to create a high-impact dystopian vision of its native subject. Whether taking stock of a real life game in which contestants can safely relieve their violent, racist fantasies by ‘murdering’ black actors, or considering an existence in which your skin colour can be dialled up or down according to your choice of headgear, fabric, or walking style, Friday Black will make you reassess the way you conduct yourself in the world. That it achieves such a feat without sacrificing the pleasure of a rousing plot, or the satisfaction of an immediately arresting character is testament to its rookie writer’s understanding of what makes a compulsive short story. As its readership blossoms under the sinister rain clouds of Trump’s demagoguery, Adjei-Brenyah’s debut offers a demonic alternative vision of America which will impact on every reader which pays proper attention. It will change the way its white consumers look at black people. This is black power, 2018 style. Underestimate it at your peril."